When my older kids were younger, we used to read to them each night before bed. It was a great routine to help them settle in for the night. With 7 kids now, we have gotten away from the habit in all of the chaos of life. I wanted to try to get back to it with my 21 month old daughter and utilize her sister to be my helper. I love having a routine for bedtime, rather than just saying "It's Bedtime", and that is all. I had Shiloh read Time for Bed, Sleepyhead to Jurnee for a few nights. It is a bit of a long book for a toddler, being geared for just a little bit older. She did pay excellent attention t each night and did not get bored at all. The book is big, but not long. It has some great illustrations of the animals that really keeps the younger children's attention. "You may have seen this renowned brain expert on PBS, a TED Talk, or on the Dr. Oz Show. 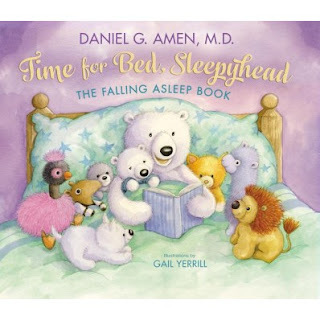 Dr. Amen's new book is called Time for Bed, Sleepyhead and it is psychologically designed to help trigger sleepiness in children to get them to fall asleep. The book uses guided imagery and gently stimulates the child's brain into falling asleep. Dr. Amen used this tactic on his own daughter and has taught it to many patients' parents as well". Super cute animals like Eli the Anteater, Liam the Llama, and Emmy the baby Emu are headed to the beach for a day of fun along with the listener of the book. They imagine the hot sun and warm water and play on the beach. Afterward they head back home for a nice bubbly bath to help relax the tired animals and an attempt at eating dinner. The book has you insert yawns at appropriate time! They will become real yawns believe me. The animal friends begin to have dreams and Mama bear kisses cub goodnight. Reading is a wonderful way to bond with your child and help them settle in for the night! Watch for this book on sale Sept 16th!